As long as kids keep playing the game, I’ll keep making the treats! Go Steve! Hi! Curious what are the dimensions of the characters? Like how tall are they? Thanks! Hello, these are so cute! You are very creative – love your work. How much do you charge for these cupcake and cake toppers both? Also, how long would it take before these could ship? Thanks! 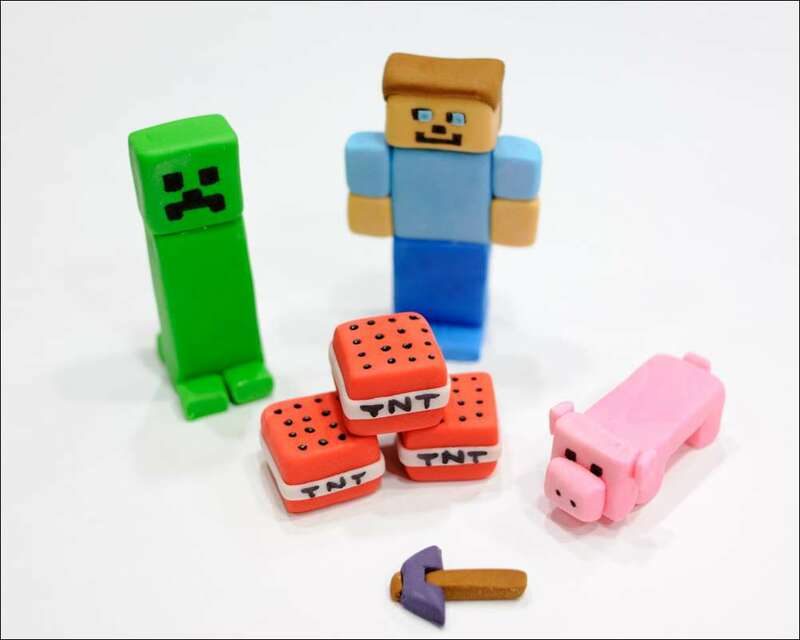 The 7-piece cake topper set (Steve, creeper, pig, pick axe, 3-TNT) are $52 and the cupcake toppers are $12/dozen plus shipping (typically around $7, depending on where you are). If you order now, they could ship early next week for delivery by Feb 21st. Let me know if you’d like them and I will arrange payment through Paypal. P.s., just to clarify, this is the cost when ordered together. The cupcake toppers are typically $20 per dozen when ordered separately without the cake toppers (I give a deal when you get both :0). Without more specifics, I’m not certain about which part of the cake you need help with….the cake or the fondant figures? 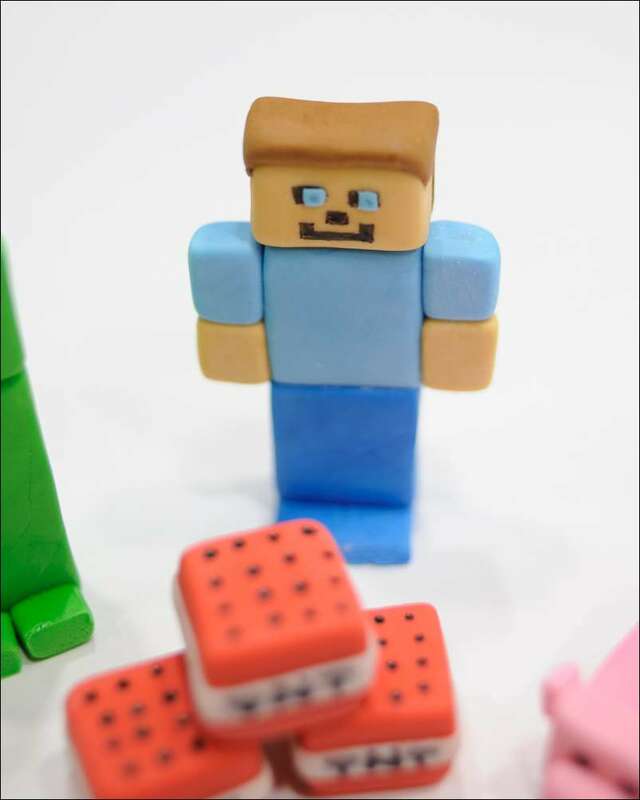 If it’s the figures, there are a couple of good tutorials online, just search “Fondant Minecraft Figures.” You could also order them from me ($52 plus shipping), but I need a week for them to dry in order to ship, so you’d need to let me know soon. For the cake, this one is a 3-layer 10″ square chocolate cake with chocolate buttercream and crushed Oreos on the sides for dirt. 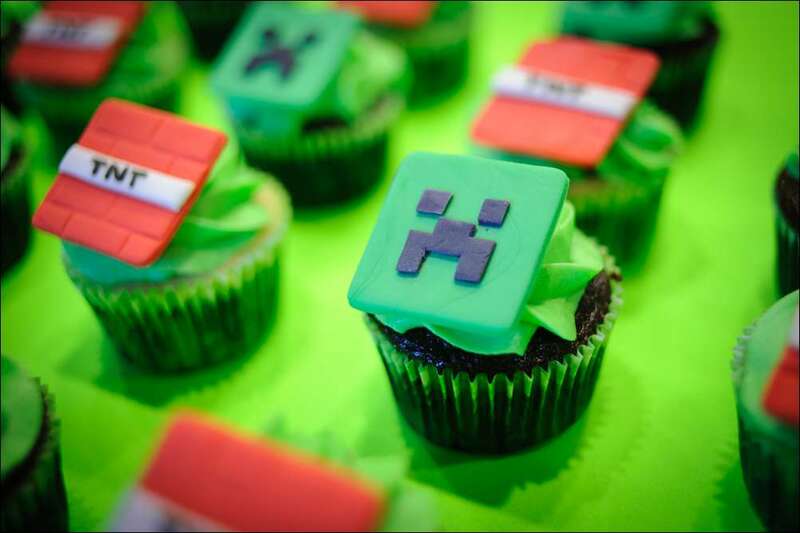 The green grass is piped green buttercream. Hope this helps! Let me know if you’d like to order the Minecraft figures. How much for the cupcake toppers and all u have for cupcake toppers are creepiest and rent ?? Or do u have others ?? How much to ship to rhode island and how long to ship ?? 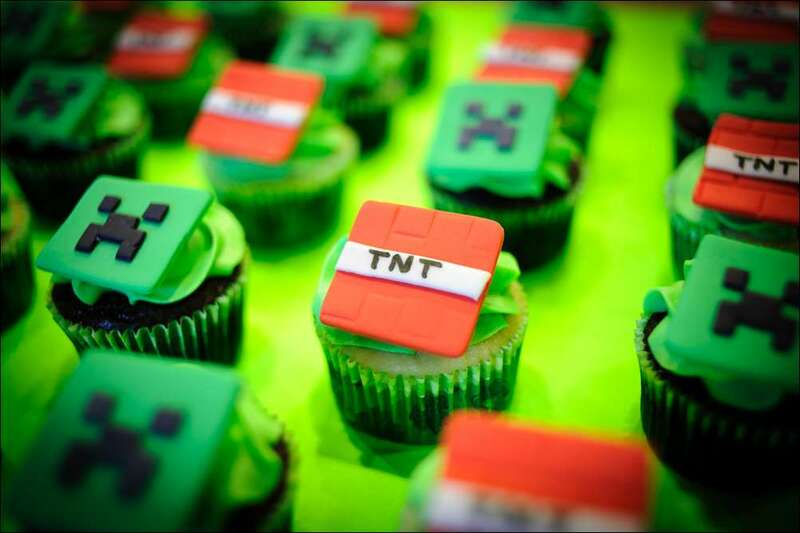 I was wondering how much you charge for 4 dozen mine craft toppers? I live in New York. Hi Dawn….I assume you mean the flat square cupcake toppers? 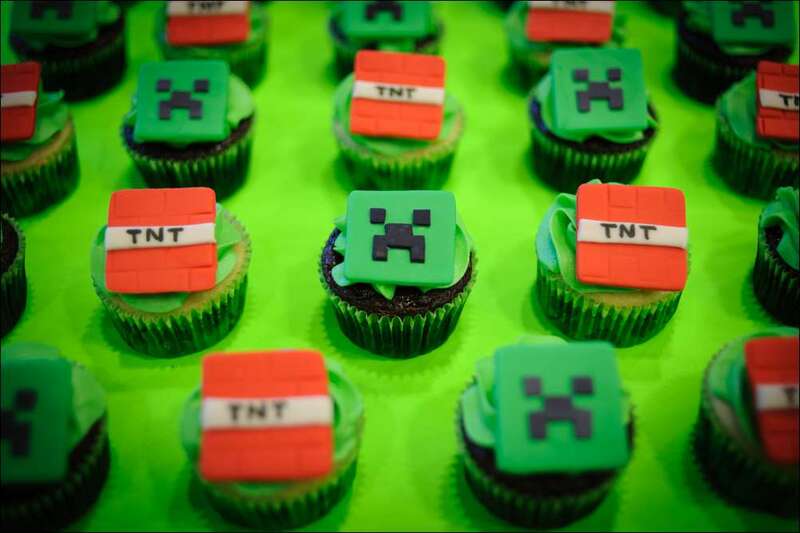 They are $1.50 each for creeper/TNT. So 4-doz would be $72 plus shipping. Shipping is typically around $10 to your area (I need your address to calculate exact shipping cost). Hi Laurie….I was interested in a dozen of the cupcake toppers but would need by April14, is that doable? Hi Rachel, where are you located? If out of my area, I need a few days to make them and the need to dry before shipping. Let me know, thanks!! Great, that’s close! I can mail them 2-day express mail on Monday (4/11) to get to you by (4/13). Give me your address and I’ll generate an invoice in PayPal. I’ll start working on them once I get payment. Thanks for the order😄! Hi Laurie – yes that’s correct. Hi Laurie – yes correct, how far you from Burgettstown? Perhaps I can drive out and pick them up, thanks! Looks like you’re about 1 HR-15 min away from here. I’m in Poland, OH. its ok, just go ahead and send them, thank you! I just wanted to update you that I’ll be shipping the cupcake toppers on Monday for delivery to you NLT Wednesday. I’ll send you a tracking # as soon as I get it.